Najib Mahfuz is Egypt's most famous novelist and the first Arab to win the Nobel Prize in Literature. Najib Mahfuz was born in Cairo, Egypt, on December 12, 1912. He was the youngest of seven children in a middle-class merchant family. When he was ten years old, his family moved to a more Westernized (reflecting the ideals of Europe and the United States) neighborhood of Cairo. Mahfuz became fond of reading detective stories, going to the movies, playing soccer, and listening to music with his friends. During his high school years he began to read the Arabic classics as well as the Western ones that he could find in translation. to work until he retired as director of the Cinema Organization, after which he worked as an adviser to several cultural organizations within the Egyptian government. 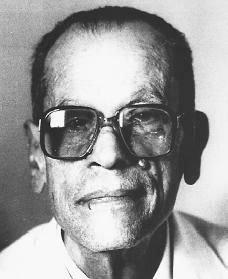 Mahfuz made frequent contributions to the daily newspaper Al-Ahram, where most of his writings appeared in serial form before being published in book form. He was married in his early forties and is the father of two daughters. Mahfuz's early writings are considered historical because he dealt with subjects inspired by ancient Egyptian history. In an interview with the magazine Al-Hawadess, Mahfuz corrected this notion by saying that only one of the early three works— Kifah Tiba (The Struggle for Thebes, 1944)—was a true historical novel. With Al-Qahira Al-Jadida (New Cairo, 1945), Mahfuz then began a series of novels that dealt with more contemporary (current) subject matter and characters. Most of the novels after these bear names of the old-time areas of Cairo, such as Khan Al-Khalil (1946) and Zuqaq al-Midaq (1947). Mahfuz's trilogy (series of three dramas), Al-Thulathia (made up of Bayn al-Qasrayn, Qasr al-Shauq, and Al-Sukkariyya ), written between 1946 and 1952, traces the changes undergone by a family in Cairo and its leader, Ahmad Abd a-Jawad. Through his characters, Mahfuz skillfully describes the cultural and political problems that Egypt experienced in the early 1900s. Al-Thulathia was considered a major contribution to world literature and a unique contribution of Egyptian genius. It was awarded Egypt's highest literary honor in 1957. In Awlad Haritna (Sons of Our Alley, 1967), Mahfuz questioned the relationship between God and man, good and evil, and life and death. His interest in the differences between 'ilm (knowledge) and iman (faith) appears throughout his later writings, such as Alf Layla wa Layla (A Thousand and One Nights, 1982). Al'Ai'sh fi al-Hakika (He Who Lives in Truth, 1985) was considered more of a historical novel than fictional writing. Mahfuz's novels have often gotten him into trouble with Arab leaders. The Children of Gabalawi (1959) was banned in Egypt because it was seen as offensive to the Islamic faith. In the 1960s several of his novels were considered attacks on the administration of President Gamal Nasser (1918–1970). Because of Mahfuz's support for Egyptian President Anwar Sadat's (1918–1981) peace treaty with Israel in 1979, his writings were banned in many Arab countries during the 1980's, although most of the bans were later lifted. In Mahfuz's Egypt, where literacy (the ability to read and write) is still not widespread, radio, movies, and television play a large role in education and entertainment. Many of Mahfuz's writings have been adapted to the screen and stage. This enabled him to become widely known and admired throughout the Arab world. In October 1988 Mahfuz was awarded the Nobel Prize in literature, the first Arab writer to be so honored. Asked about his plans for spending the $300,000 prize money, the New York Times reported that he looked at his spouse and replied, "That is my wife's job." It surprised many when, in a 1992 interview with the Paris Review, Mahfuz criticized fellow author Salman Rushdie (1947–), whose novel The Satanic Verses had led to the offer of a million-dollar reward for Rushdie's death by Iran's religious leader, the Ayatollah Khomeini (1900–1989). In 1994 a Muslim extremist (one who holds extreme political or religious views) stabbed Mahfuz. The attack damaged nerves in Mahfuz's arm. Mahfuz was a vocal critic of the September 2001 terrorist attacks on the United States, although he also stated that war was not a solution to the problem of terrorism. In 2002 it was announced that a statue of Mahfuz would be built in west Cairo to honor his achievements. Although Mahfuz continues to write, his failing eyesight and problems with his arm have caused him to restrict himself to mostly shorter pieces, such as a series of descriptions of his dreams that have been published in Egypt's Nisf Al-Dunia magazine. Beard, Michael, and Adnan Haydar, eds. Naguib Mahfouz: From Regional Fame to Global Recognition. Syracuse, NY: Syracuse University Press, 1993. Honan, William. "From 'Balzac of Egypt,' Energy and Nuance." The New York Times (October 14, 1988). Mahfouz, Naguib. Echoes of an Autobiography. New York: Doubleday, 1997. Peled, Matityahu. Religion, My Own. New Brunswick, NJ: Transaction Books, 1983.